This recipe can be called or considered “salad-dessert" as this dish is prepared with grated carrot which indicates that is a salad ... but when it is tasted its sweet flavor reveals that it is a dessert . 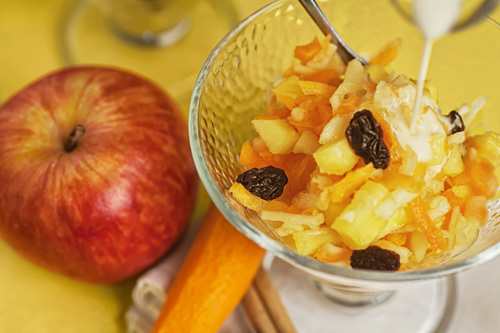 In this dessert the carrot is accompanied of sweet fruits like the apple and the pineapple. Then the fruits are mixed with other delicious ingredients to give a grandiose flavor. Although there are many ingredients combined, the carrot’s flavor stands out and it is always accompanied of sweet notes. It is very simple to prepare this dessert. You only have to peel, grate and mix ingredients. In this recipe pineapple juice is used, preferably use natural juice. The carrots of this dessert are used peeled and it is easier to peel them with a peeler than with a knife. Preparation time 5 minutes . Add in a bowl 1/4 cup of raisins and reserve. Dice 5.6 oz of pineapple in syrup, then toss them in the bowl and reserve. Peel 1 apple and 2 carrots. Grate the apple and the carrots that were peeled, upon completion put these ingredients in the bowl and reserve. 1/2 can of Condensed Milk. 1/4 cup of Evaporated Milk. 1/4 cup of Pineapple Juice. Beat the bowl ingredients with a ballon whisk or with a fork, until they are well integrated. These ingredients are beaten in another bowl so they integrate better. Pour the mixture that was beaten in the bowl over the other bowl, where the sweet salad is. Mix very well the sweet carrot salad with a mixing spatula. Serve the sweet carrot salad and add cinnamon to taste. Tip: At the moment of serving the dessert, it can be garnished with chopped nuts. They will give an exquisite point to the salad. Recommendation: If this dessert is refrigerated for about 20 minutes before serving, it will have a better consistency. Did you like the Dessert? Make your life easier with the “Black & Decker Food Processor". It grates everything in a blink. This pineapple is sweet and juicy, perfect for your dessert. If you need evaporated milk the Carnation is the best.